He loved knock-knock jokes, puns, and Star Wars, and always seemed to have a smile which belied the toll acute leukemia took on him. But eventually, that toll was too much for Jackson Hunter. The Florida boy died late last week. Hunter's family, with roots in the Philadelphia area, waged a secondary battle, to get 6-year-old Jackson into trials of a breakthrough immune treatment at Children's Hospital of Philadelphia. It uses a child's own disease-fighting T-cells to attack cancer. When Florida Medicaid officials refused the family's request to bring him to Philadelphia, their appeals went viral, gathering support up & down the East Coast. The Medicaid officials reversed their decision, and Jackson came north for treatment. It looked like Jackson might make it, but complications set in. 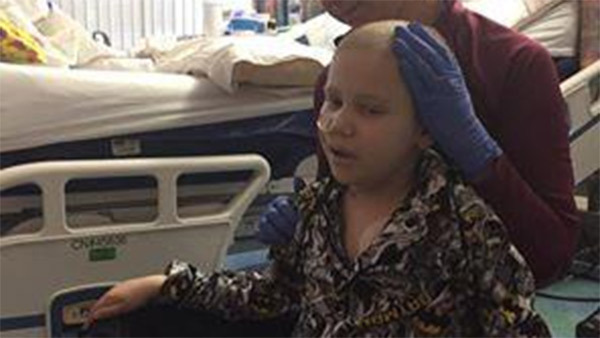 Last December, Jackson was all smiles when a reporter visited his hospital room in Florida. "Well, I have these skull p-j's, and here's my tux," he'd said, showing off his favorite attire. Friends and family had created the Action4Jackson Facebook page, to raise support for the experimental treatment, and to help defray the family's medical expenses. Jackson's mom, Gina, a Bucks County native, was determined to try the treatment. "I just put it out there that this is a very dire moment. We need approval, and we need it now, we need it yesterday. It went viral. People just calling," she noted. His dad added, "Thousands of people of people were all fighting for you, buddy." By mid-May, however, Jackson's leukemia had returned, and the family decided to go home to Florida under hospice care. Days later, his family delivered - the somber news on Facebook. The Hunter family says they'll mourn for a time, but plan to stay active in fighting for children's health.